was actually discovered by Pierre Méchain in 1781, rather than his friend Messier. 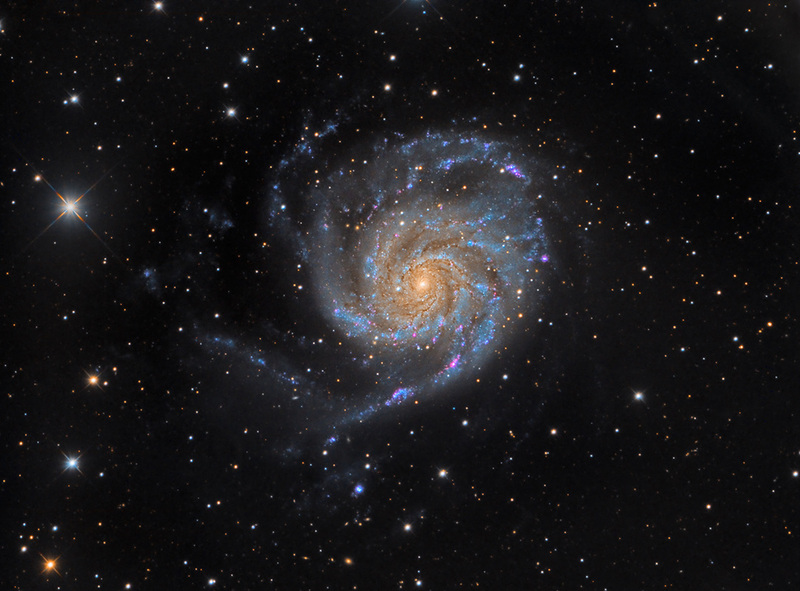 M101 heads a namesake group of smaller galaxies. Observations with the Hubble Space Telescope place it at 25,000,000 light-years distance from Earth. The Pinwheel is well over double the size of our own galaxy, yet if this 'face-on' were seen on edge, its disk would appear very thin. Notice the asymmetrical spiral structure, copious dust lanes, and the many pinkish knots of HII (Hydrogen) regions in the spiral arms. These are like the emission nebulae in the arms of our own Milky Way.